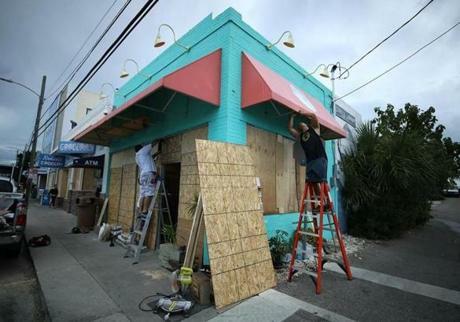 Workers boarded up the Wrightsville Beach Art Co. while preparing for the arrival of Hurricane Florence in Wrightsville Beach, N.C.
WILMINGTON, N.C. — Coastal residents fleeing a potentially devastating blow from Hurricane Florence encountered empty gasoline pumps and depleted store shelves as the monster storm neared the Carolina coast with 140-mile-per-hour winds and drenching rain that could last for days. 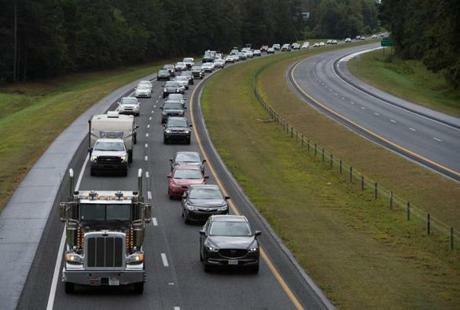 A steady stream of vehicles full of people and belongings flowed inland Tuesday, and North Carolina Governor Roy Cooper tried to convince everyone to flee. ‘‘The waves and the wind this storm may bring is nothing like you've ever seen. Even if you've ridden out storms before, this one is different. Don’t bet your life on riding out a monster,’’ he said. Residents evacuated from coastal areas near Wallace, N.C., on Tuesday. 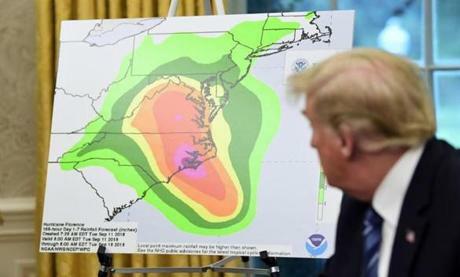 President Trump declared states of emergency for North and South Carolina and Virginia, opening the way for federal aid. 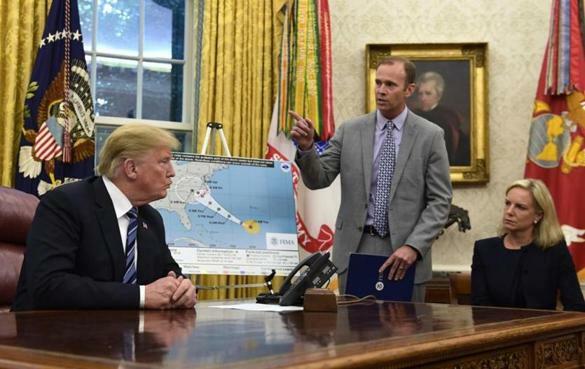 He said the federal government is ‘‘absolutely, totally prepared’’ for Florence. ‘‘This morning I drove around for an hour looking for gas in Cary. Everyone was sold out,’’ she said. 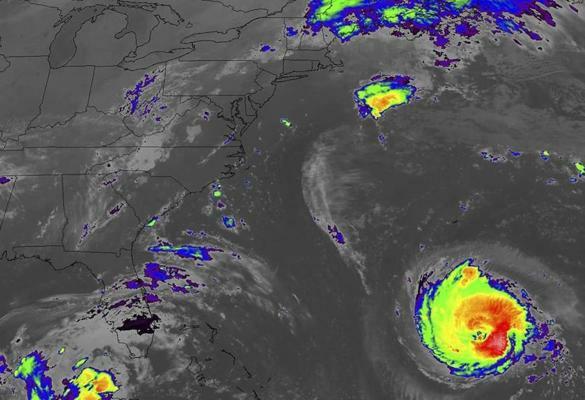 NOAA/RAMMB satellite image of Hurricane Florence off the US east coast in the Atantic Ocean on Monday. Florence is so wide that a life-threatening storm surge was being pushed 300 miles ahead of its eye, and so wet that a swath from South Carolina to Pennsylvania could get deluged. ‘‘There’s no water. There’s no juices. There’s no canned goods,’’ Kristin Harrington said as she shopped at a Walmart in Wilmington. 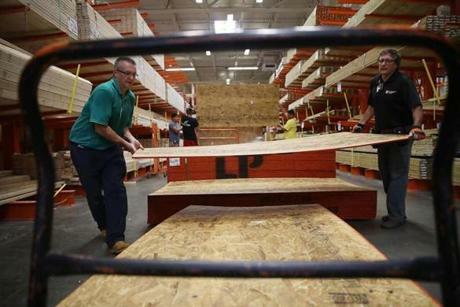 Home Depot employee Ken Murphy helped Joe Spielman (left) load plywood at a store in Myrtle Beach, S.C.
People weren’t the only ones evacuating to get out of the path of Hurricane Florence. Eight dogs and 18 cats from a shelter in Norfolk, Va., were sent to two shelters in Washington, D.C., to make room for pets expected to be displaced by the hurricane. At 11 p.m., the storm was centered 670 miles southeast of Cape Fear, N.C., moving at 17 m.p.h. It was a potentially catastrophic Category 4 storm but was expected to keep drawing energy from the warm water and intensify to near Category 5, which means winds of 157 m.p.h. or higher. ‘‘This one really scares me,’’ National Hurricane Center Director Ken Graham said. Rain measured in feet is ‘‘looking likely,’’ he said. ‘‘This storm is going to knock out power days into weeks. It’s going to destroy infrastructure. It’s going to destroy homes,’’ said Jeff Byard, an official at the Federal Emergency Management Agency. Adam Gartrell (left) and Colin Kern walked out toward the surf in Wrightsville Beach, N.C.
One trusted computer model, the European simulation, predicted more than 45 inches in parts of North Carolina. A year ago, people would have laughed off such a forecast, but the European model was accurate in predicting 60 inches for Hurricane Harvey in the Houston area, so ‘‘you start to wonder what these models know that we don't,’’ University of Miami hurricane expert Brian McNoldy said. 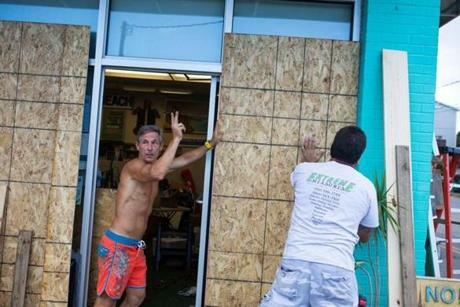 Jazz Undy, owner of Wrightsville Beach Art Co., waved to a friend while he helped board up his shop on Wrightsville Beach. 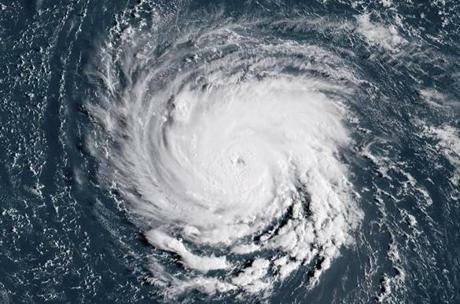 Despite all that, 65-year-old Liz Browning Fox plans to ride the storm out in the Outer Banks village of Buxton, N.C., despite a mandatory evacuation order. Her 88-year-old mother refused to evacuate and will stay with her. ‘‘Everyone who is staying here is either a real old timer, someone who doesn’t know where would be better, or someone involved in emergency operations one way or another,’’ said Fox. 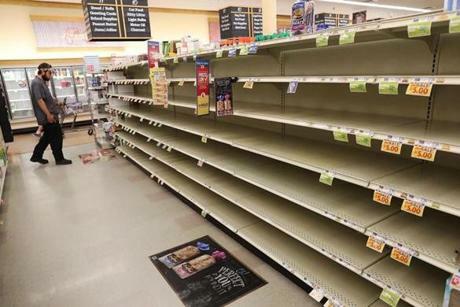 Bread shelves at a Myrtle Beach grocery store stood empty as people stocked up on food. 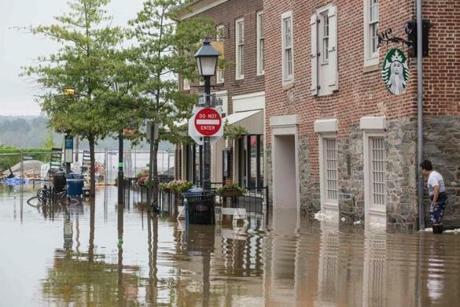 Water flooded the downtown of Alexandria, Va., on Tuesday. 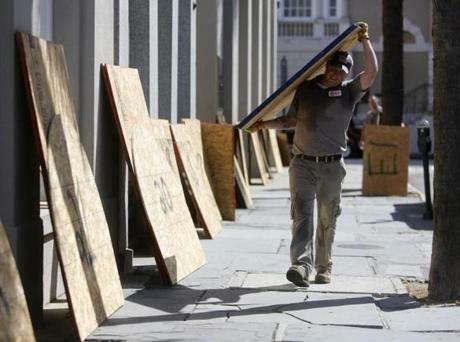 Preston Guiher carried a sheet of plywood as he prepared to board up a Wells Fargo branch in Charleston, S.C.
President Trump looked at a chart showing potential rainfall totals Tuesday during an Oval Office meeting.